This is big news. Very big news. Last night, the City Council voted unanimously to give its final approval to a sweeping and ambitious downtown development plan for New Rochelle. 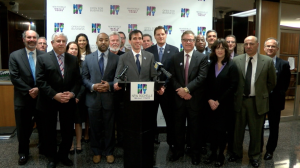 Mayor Noam Bramson announces approval of the plan with City officials and the development team. While there are no guarantees, this plan gives New Rochelle our best opportunity ever to attract investment and vitality to the downtown area – and our entire community will benefit as a result. It is likely that specific, significant projects will now come forward under this framework during the first quarter of next year. In conjunction with the Council’s vote, I delivered the following speech. I hope my words adequately convey the sense of satisfaction, optimism, and genuine emotion that surrounds this issue. You can also download my remarks as a PDF. 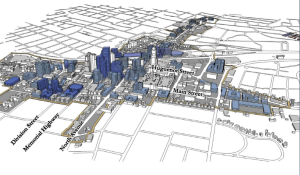 Our plan lays out a comprehensive vision for a thriving city center where all of us – whatever our means and tastes, whatever our ideal – can find a place to shop, a place to work, a place to meet, or a place to live. It’s a vision for sustainable growth that makes our region greener and more competitive. Shaped from street-front to skyline by the best urban design. And with financial terms that fund specific public benefits and put taxpayers ahead. But our plan is also more than just a vision; it’s also a detailed road-map for accomplishing that vision, because it provides developers with the clearest path ever for investing successfully in New Rochelle. Every expectation and requirement is defined up front, the environmental review is already completed, the zoning provides for flexibility in response to the market, and the approval process places professionalism ahead of politics. What’s more, with our master developers at RDRXR prepared now to launch their own catalytic projects, we’re poised to ignite the local economy right away – giving every other investor the confidence that comes from knowing that our downtown is surging forward as a whole, and that no one is alone in placing bets. Combine that with New Rochelle’s core assets – our unrivaled location and transit connections, our talented and diverse population, our great schools and libraries and neighborhoods – and there is no community in all of New York that offers a better opportunity today . . . or a bigger upside tomorrow. • My colleagues on the City Council – Lou Trangucci, Al Tarantino, Jared Rice, Ivar Hyden, Barry Fertel, and Shari Rackman – who rose to this occasion and came together across all lines or party and geography to seize an opportunity bigger than any one of us. • The members of our City’s development, planning, and legal staffs, who worked with such intensity and focus. • Our consulting teams, who provided invaluable expertise and guidance from beginning to end. • New Rochelle’s master developers at RDRXR, with whom we have worked side-by-side – constructively, creatively, and efficiently – in an unprecedented public-private collaboration. • Finally, I want to thank the many residents who took the time to express a view or attend a meeting. And I don’t mean just supporters. I mean critics, too. We heard every voice, we know that every comment was motivated by love for our city, and we recognize that this effort will succeed only if its benefits are shared equitably – and if the essential character of New Rochelle emerges whole and strong. If today marks an important ending – the culmination of a rigorous, multi-stage process of negotiating and listening, of studying and writing, of debating and approving – then it also marks a beginning. Because now that the plan is in place, it’s our job, together, to put shovels in the ground while the market is still strong and while the window of opportunity is open wide. But if there had been any doubt about New Rochelle’s readiness to turn vision into reality, about our determination to compete and to win, then the unanimity, the speed, and the enthusiasm with which we have reached this milestone should put those doubts to rest, once and for all. I repeat: New Rochelle is open for business. Let me conclude on a brief personal note. I grew up in New Rochelle. One of my earliest memories is holding my mother’s hand in Bloomingdales just a few months before it closed. I went to school in New Rochelle. I dragged my wife from Providence to New Rochelle. I am raising my children in New Rochelle. I have never considered living anywhere other than New Rochelle. I’ll probably die in New Rochelle. So I’m a loyalist. Yet from the time of that memory in Bloomingdales and in all the years since, New Rochelle’s downtown has somehow underperformed, somehow disappointed, has never quite been worthy of a city that has everything else going for it. It is the issue in our community. The issue that connects to every other issue. The issue we never stop debating. Because we all believe that the heart of our city should be a source of pride. There have been achievements and setbacks in the past 25 years. There will be more achievements and setbacks in the next 25. Tonight’s action is only one step among many. But it’s the biggest step. And by taking it, we cross over from an era of doubt and nostalgia to a new era of confidence and action. I’ve never concluded a year with a greater sense of satisfaction. I’ve never looked ahead to a New Year with greater optimism. This is New Rochelle’s moment. Together, let’s make the most of it. Previous PostVote for Schools on December 15thNext PostSeason’s Greetings and Happy New Year!